Transform the way you cleanse with the Clinique Fresh Pressed™ Renewing Powder Cleanser with Pure Vitamin C; a water-activated powder enriched with fresh Vitamin C to brighten the complexion. Forming a luxurious lather upon contact with water, the Fresh Pressed™ formula is effortless to apply and allows for an exhilarating cleansing experience. The cleanser delivers instant results, revealing an awakened complexion that is purified, refined and visibly bright. Without stripping skin of essential moisture, the face wash is gentle yet effective and is ideal for preparing skin for the Clinique Fresh Pressed™ Daily Booster. 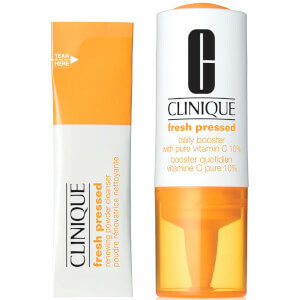 Housed in stay-fresh packaging, the potent Vitamin C powder is isolated until exposure to oxygen, which activates the cleanser and allows for maximum results. Versare la polvere sulla mano bagnata. Lasciare in posa un minuto per catturare la potenza della vitamina C pura.